Wood Cutting Blocks are finely Sanded and are type high .918 inch thick for printmaking artists. on both sides and is .918 " thick. Woodcut Block of Solid Soft Maple is perfectly sanded on front and back. 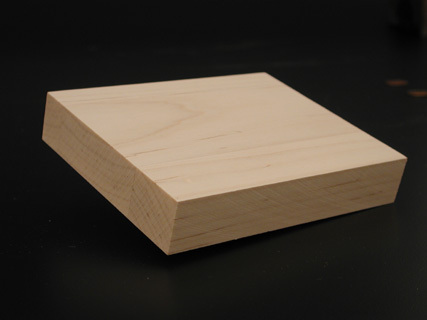 Wood cut block has two good sides for woodcutting and making woodcut prints. Print blocks are made to the exact dimension for printing on a letter press which is type high .918 inch in thickness. Prints can be made with or without a letterpress by rubbing the inked woodcut block by hand with an object such as a baren or wooden rice spoon. Any size print can be mounted archivally and hang without framing by using Art Boards™ Archival Mounting Panels. Archival Mounting Panels can be made as large as 4' x 8'. Art Boards™ also does custom mounting of prints, drawings and paintings as large as 48" x 96" to panels.